Blade Kitten is a game I discovered pretty much by accident. I came across it randomly and thought the premise sounded interesting, so I bought it. It was one of the first Steam games I purchased, and, actually, my computer at the time wasn’t powerful enough to run it. After forgetting about it for a while, I finally got around to playing it. Basically, Blade Kitten is a 2.5D action-platformer. It keeps you on a strict path with no real chance for deviation. However, unlike the old Metroidvania games, this game doesn’t force you to wander around trying to find the right path the exit; it is fairly linear in that regard. There are other, sometimes hidden, paths that can lead to treasure, but for the most part, there’s only one way to go and it’s really hard to get lost. 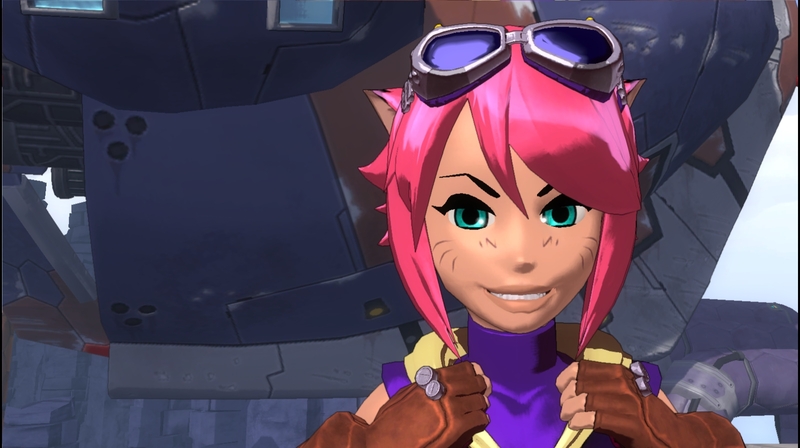 You play as bounty hunter Kit Ballard, a pink-haired cat-girl, who has come to track down a high-priced target when a fellow bounty hunter, and Kit’s rival, shows up, destroys her ship and steals her key in an attempt to claim the reward for herself. Thus, Kit begins to chase after her, which leads to a bunch of misadventures. The story is told across thirteen missions that act as chapters, as if it was a book, which makes sense since the game is actually based on an indie comic of the same name, and the story is a prequel to the comic. It is not necessary to have read the comic beforehand, as I haven’t read it and I understood the story just fine. However, it wouldn’t hurt, as the game makes no effort to explain the characters’ origins or terminology, and there is a lot going on in this rich universe. Between keeping track of the characters, the various political factions and all the sci-fi tech, you just have to be paying close attention to catch everything. The story itself presents a wide range of subject matter. It tries to include dark and serious elements such as startling plot twists about the nature of the missions and secrets from Kit’s past, and, while it does add depth to the story, overall, the game is too tongue-in-cheek for any of it to really have a dramatic effect. Kit is, for lack of a better term, a wise guy. She always has the quick comeback, dropping sarcastic one-liners whenever she can and using Internet lingo such “Win get!” when picking up treasure or “Epic fail!” upon dying. The enemy soldiers only perpetuate the absurdity by using callsigns like “Oscar Mama Golf” (OMG) and Whiskey Tango Foxtrot (WTF). There’s nothing laugh-out-loud funny, but it’s definitely amusing to say the least. The gameplay is rather simplistic. You can attack enemies close-up or use a ranged attack. You also have the option of erecting some kind of shield or barrier, rendering you invincible while it’s active, but you are also unable to move, so it’s only useful to avoid taking damage when under heavy siege. Not that you’ll really need to resort to that too often, as most enemies can be killed without much trouble. Besides, your health regenerates, so there’s no excuse to run into a fight when you can’t take a couple hits. 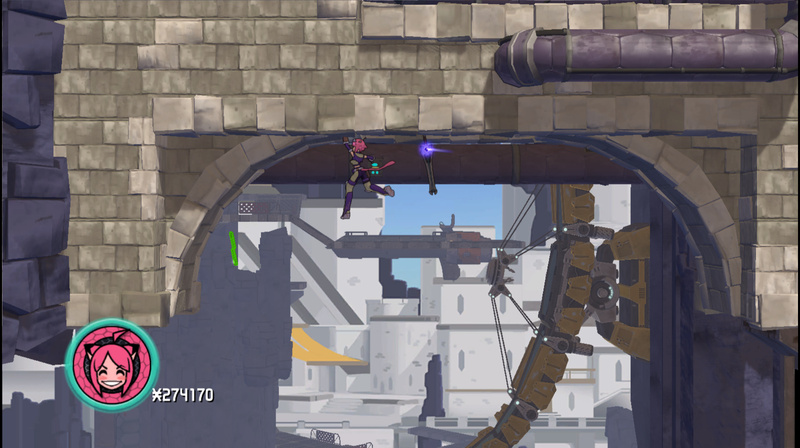 Aside from the running and jumping found in most other platformers, Blade Kitten gives you another option: climbing. 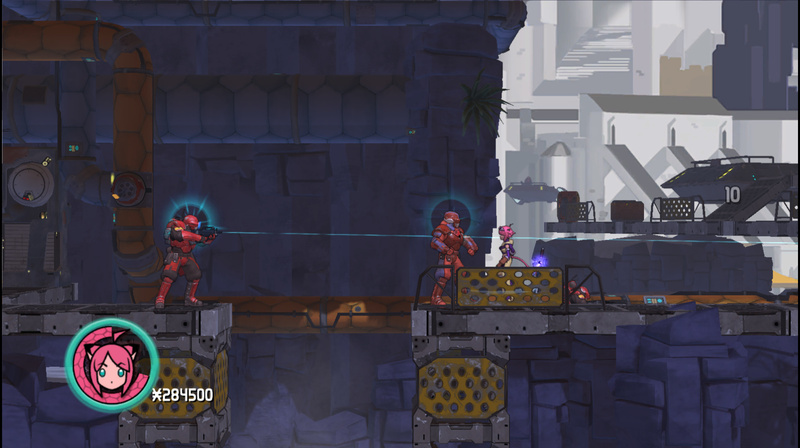 You can climb walls, cliffs and even across overhanging ledges and platforms. There are a few stages that have what can best be described as a boss fight at the end. Sometimes, it’s not even a fight, but rather a chase scene where you need to catch up to or outrun something. 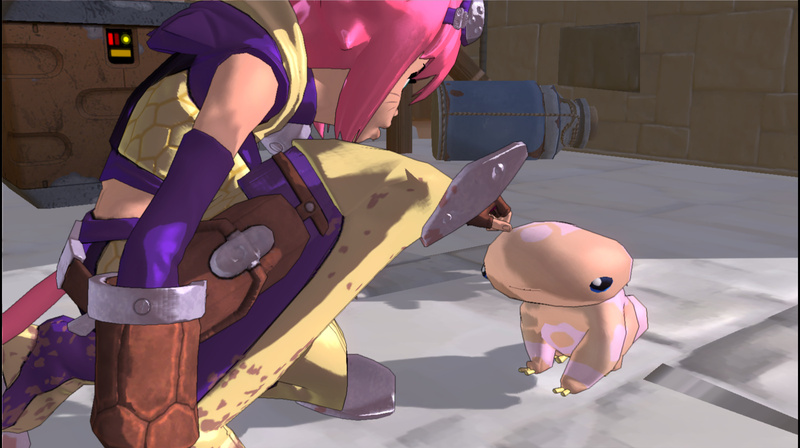 When you do have to fight someone, combat is usually a little more challenging than just hack-and-slash. Beating a stage allows you to go back and replay it, giving you a chance to improve your times and collect 100% of the treasure. Along the adventure, you encounter some friends that will help you along the way. Early in the game, you can unlock a store which you can access through the Pause menu. The merchant Hundert Tonne will sell you weapon upgrades, health and stamina boosts, as well as new costumes. You also run into a cat-like critter called a Skiff, which Kit affectionately names Skiffy. 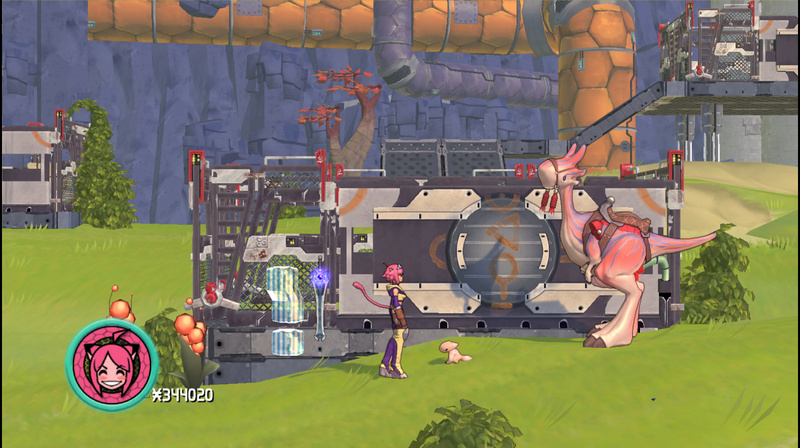 Skiffy can be used to collect treasure and trigger otherwise inaccessible switches needed to continue. Kit also gets a mount — a creature called a Noot — which looks like a cross between Yoshi and a camel. Being based on a comic, the game’s art has a definite comic book feel to it. The character designs are clearly influenced by anime, as evidenced by Kit’s big eyes, pink hair and wild costume. Everything is well-drawn and very colorful. The cutscenes are fully animated and feature voice acting, which is done fairly well. The main theme is catchy, and the rest of the soundtrack features a collection of funky, upbeat tunes really that fit in with the tone of the game. For a game I decided to purchase on whim, I am greatly pleased at how much I enjoyed it. Blade Kitten has all the elements of a great game: an entertaining story in a well-developed universe, beautifully colorful graphics, easy-to-learn gameplay mechanics, and a catchy soundtrack. It’s simple and doesn’t provide much of challenge, which may be negative to some people, but, in a world where hard-as-nails platformers are standard, I found it refreshing to be able to just pick up and play it. The game doesn’t take very long to beat — maybe five hours or so depending on how thoroughly you explore and how skilled you are. 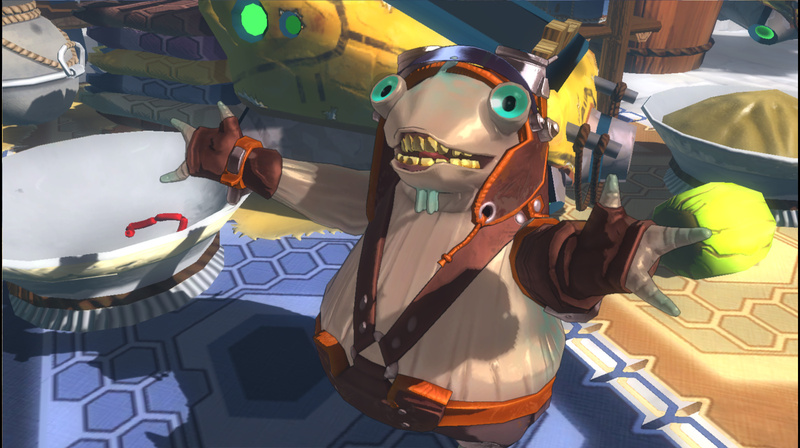 Being both short and fun gives it immense replay value. The one big downside is that the story ends, not exactly on a cliffhanger, but unfinished; although, a second episode is promised on the end screen. It’s been a few years, but the developer has recently indicated that a follow-up is indeed nearing completion. I’m really glad I found this game and can’t wait for the next one. Blade Kitten is not a perfect game by any means, but it’s fun and isn’t that what games are about? 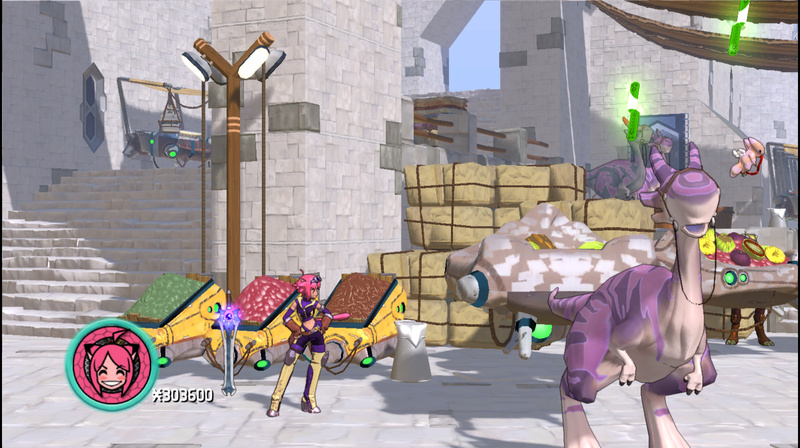 Blade Kitten is available on Steam for $5.99, and on PSN and XBL for $4.99.